What Are the Elements of a Pizza? Pizza is one of the most popular foods in the entire world, and there are three primary elements that make up this scrumptious dish. If you’re looking Fremont Street pizza Las Vegas has to offer, then you should ensure you select a pizzeria that prepares an excellent balance of the three main elements that comprise a pizza. While there are various different types and styles of pizza, from downtown ones to Chicago-styled ones, all pizzas contain three basic elements. The crust is the foundation of the entire pizza and is the most important part of the dish in many people’s opinion. The manner in which the crust is made can affect everything else about the dish. For instance, a pan crust is thicker and fluffier and result in the pizza having more of a bread-like taste. However, a thin or crispy crust pizza allows you to taste the cheese, sauce and toppings more and can come with a slight crunch. Regardless of whether you prefer thick or thin crusts, a crust is an essential element of a pizza and the first one that must be made. Sauce is another element that all pizzas must have, and many people say that the secret to a pizza recipe is in its sauce. 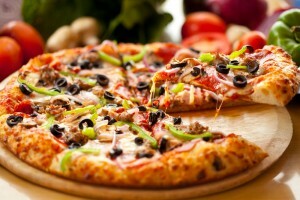 Various pizza makers use different recipes and ingredients to make their sauce. While most pizza sauces are made out of a tomato base, there are also white and cheese-based sauces as well. Additionally, the amount of sauce that you put on the crust can greatly affect the impact in taste that the finished pizza has as well. Of course, the cheese and toppings are usually the last components of a pizza, and they greatly affect the taste of it as well. There are numerous types of cheeses that can be used on pizzas as well as virtually any type of topping that you can think of. For instance, some people top their pizzas with all vegetables, whereas others prefer to top theirs with meat. Regardless of the cheeses and toppings used on a pizza, there usually must be something placed atop the crust and sauce to complete the pizza and provide it with added flavor.